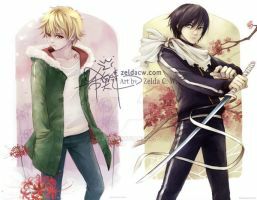 Yato and Yukine from Noragami! Drew this as a matching pair to the red version below -- shinki, themes and colours and all. Will be available this fanime in both 11x17 and 8.5x11 versions, probably. psst if you've only watched the anime... please read the manga too .. well worth the time. Thank you! Haha my drawings can get pretty messy but I'm glad you think so otherwise. I kept seeing this on Google when I searched for images of these two, and now I've finally found the source! LOVE this picture--the colors are gorgeous, and the layout is phenomenal!! You ROCK!!!! Ehehe thank you!! I admit it's my fault for posting in a way that would make it hard to track the source down-- nevertheless I'm glad that you've followed the trail back here. Thank you so much, words like yours are what keep me going ! I love those two and their relationship, it's probably my favourite one in the series. Well, what can I say, the artwork is beautiful. I like the cold colors with some warmer ones added here and there and eyes and... everything, honestly. I like how bandages are an important part of the background. They really help with adding depth to the picture. Oh, and I think the titles are just fine! I mean, Yato is pretty simple but I think it works really well with your Yaboku artwork. And since they are in contrast with each other, it's a good match. You know, something like.... Past vs Present? Ahaha yes, that was definitely what I was going for in the naming, though my third noragami print is pretty much called yatogami -- just figured I was bound to run out of titles at some point. :b Thank you for your comments on both pictures though! The past/present motif was what I wanted with the elements and colour schemes as well, happy to hear the contrast works. And I really love yato and yukine too, they make such a dorky partnership that's beyond endearing, hehe. I've seen this reposted all over creation without a credit to you. I was going to reblog it on tumblr, but since I was able to track you down, I wanted to ask if it would be alright if I posted it to tumblr with a credit and linkback to you. Is that something you would be alright with? If not I will not reblog it, nor post it there without your permission. Oh! Well, that was certainly a lack of foresight on my part-- I've a version on tumblr ( avodkabottle.tumblr.com/post/1… ) but since it contains the picture as a gif, I can see why some might overlook or choose to repost. In any case, you're entirely welcome to repost this with credits! Thank you so much for asking me and letting me know of things, I do appreciate it. Of course! I appreciate the prompt reply and your permission. Here is a link to the version I posted: norablogami.tumblr.com/post/14… Thank you again! Oh god... It's really beautiful, I am in love with your draw styles ! You're welcome, but I like so much Yato and your art ! Wow, this gets me motivated. My goal in life is to get as good as this, to make the world more amazing. You are a huge encouragement in an indirect way. Your comment likewise is a motivating force to keep going at it! I'm glad if this could in any way help along on your journey... it's always an honour to know if others are aiming to shoot above and beyond what I can offer. Thank you too for sharing this! And thank you for working so hard to make your art so amazing. I love this pairing. I REALLY need to read the manag. I can't get enough of these two. Yes please do! And I think they make great partners, such a funny familial relationship, haha. Ehehe awesomeee, hope you've enjoyed/are enjoying it so far when you do. I absolutely loved every volume, I'll make sure to continue! do you know how much it would be??? hmm, I'm probably going to have them at the same price as what I had for AX, $15 USD for 11x17's and $10 USD for 8.5x11's. :'D My table partner said those are the standard prices around fanime/AX ...! I do hope that's reasonably within your budget. And I watched you because of this drawing! Ahaha oh gosh, thank you! Do be warned that I'm not much of a frequent fanartist (doh), but I appreciate your visiting of my gallery all the same too. Well I prefer Original Character so ^^ but that doesn't matter because I really like your art! !